I loved this book too ….although I think Gus’s line is cribbed from something Guy Butgess said , isn’t it . Fantastic sense of the period …..I love her writing and can’t help thinking she is a little underrated such a versatile writer . You may well be right about the Burgess quote. I love it, though. It’s about time she was given the credit due to her – not just an accomplished novelist but a brilliant poet and children’s book writer, too. I really enjoyed Exposure too. Such great characterisation and the section in Kent had a gorgeous sense of place. It’s one of her best, I think. And that’s saying something! This is why I love blogs (relatively new to the blogosphere)! 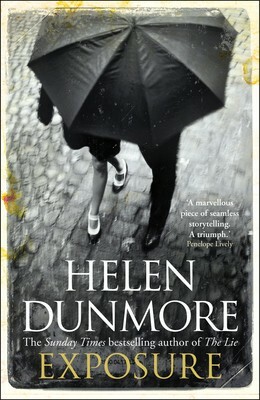 I will definitely check out Helen Dunmore. I didn’t even know she existed!! What a lovely comment and welcome to my little bit of the blogosphere! Lots of treats in store from Dunmore. She’s got quite a few excellent novels under her belt and is an an award-winning poet, too. I hope you manage it, Alex! I still haven’t read Dunmore, but the positive reviews of this one have been coming thick and fast. It does sound very appealing…and I do find this era hard to resist! I have yet to read a book by Dunmore, although she’s been on my radar for a while now. This one sounds so good, but I’m guessing that several of her books are just as good, so I might start with one that’s already available at my library. Do you have any favourites? How does this one compare to her others? I’d recommend Talking to the Dead or The Siege – both very different, both excellent and both as good as Exposure. Just one to avoid and that’s Counting the Stars. I’d love to hear what you think of her work, Naomi.